Rights advocates say the new directive prevents migrant parents who were separated from their kids under zero tolerance from asking for asylum in the U.S.
WASHINGTON — After a court order to reunite more than 2,000 migrant children who were separated from their parents in May and June, the Trump administration has instructed immigration agents to give those parents two options: leave the country with your kids — or leave the country without them, according to a copy of a government form obtained by NBC News. Advocates say that even migrants who have already passed their initial asylum screenings are being presented with the form. "We are seeing cases where people who have passed credible fear interviews and have pending asylum claims are being given this form," said Lee Gelernt, a lawyer with the American Civil Liberties Union who is leading a class action lawsuit for family reunification. Under zero tolerance, immigration agents had been instructed to separate all children from parents caught crossing illegally. Trump reversed that decision with a June 20 executive order, but didn't provide a clear path toward reunification for more than 2,300 children who had already been separated. Parents and children who entered the U.S. after June 20 are being kept together in detention. Asylum law dictates that immigrants should be allowed to make an asylum claim before a judge even if they have been given an order of deportation. Immigration rights advocates say forcing parents to choose immediately between leaving the country with or without their children means they are effectively prevented from asking for asylum. "A child should never be held hostage to force a parent to relinquish their legal right to seek asylum," said Wendy Young, president of Kids in Need of Defense (KIND). In a June 26 decision, U.S. Judge Dana Sabraw of the Southern District of California ruled that the government must reunify the separated parents from their children, but made no stipulation that parents must be allowed to remain in the U.S. with their children while they wait for a judge to hear their asylum claim — a process that can take years. 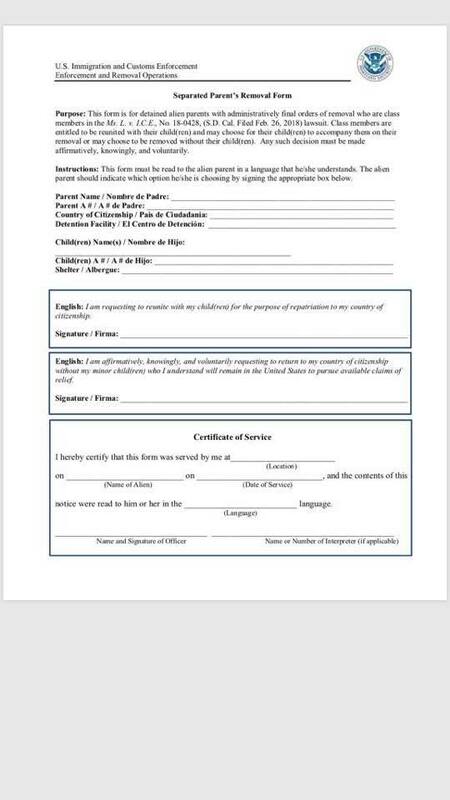 The form U.S. Immigration and Customs Enforcement (ICE) agents are directed to read to detained parents instructs them to sign next to one of two lines: "I am requesting to reunite with my child(ren) for the purpose of repatriation to my country of citizenship," or "I am affirmatively, knowingly, and voluntarily requesting to return to my country of citizenship without my minor child(ren) who I understand will remain in the United States to pursue available claims of relief." The agents are instructed to read the form in a language the immigrant understands, which usually means Spanish, but it can be hard to find Americans who know the indigenous languages spoken by many migrants. A spokeswoman for ICE, Jennifer Elzea, said the form is designed to be given to immigrants who have received a final order of removal. "An individual who has received a final order of removal has already been given the opportunity to make a claim of fear about returning to his or her country of citizenship," Elzea said. But she did not say whether those claims had finished being adjudicated before parents are given this form. "Alien parents who are ordered removed can elect to be removed with or without their children. Neither choice has any bearing on the alien's eligibility to apply for protections available to them under the law," Elzea said. But in the vast majority of cases, immigrants must be inside the country they wish to remain in before they make an asylum claim. Similar instructions were given to child welfare workers in U.S. Health and Human Services shelters before Trump ended family separations. 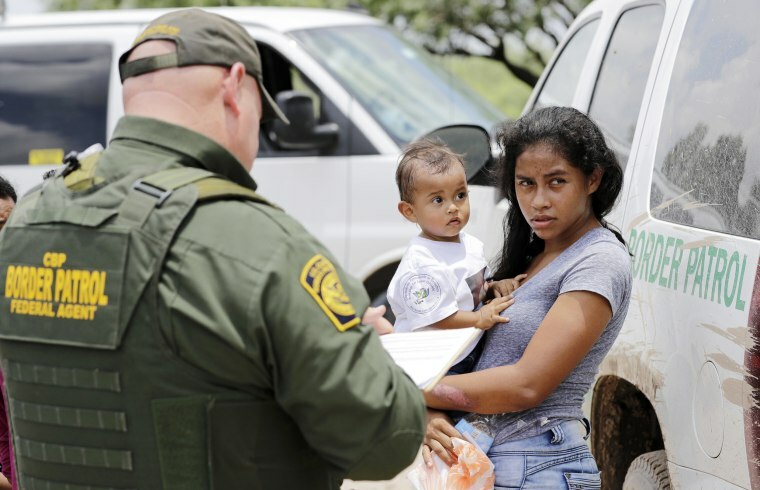 The workers were instructed to reunite parents and children only if the parents agreed to drop their own asylum claims as well as the claim of their child and be deported. Families who arrived in the U.S. after Trump ended parent-child separations are being detained in family detention centers while waiting for a decision on asylum or deportation. The Justice Department has petitioned in a separate court case that the government should be allowed to hold children with their parents indefinitely.